Adults 1/4" - 5/16". Female houseflies lay 400-600 eggs in decaying matter or faeces which develop into maggot larvae. Attracted to any uncovered food or organic waste.Found in almost all types of premises.Breeds in moist decaying vegetable matter. 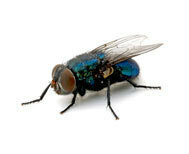 House flies are the most common pest in and around home. Most adult house flies travels with in one mile of sites where eggs are laid. House flies get attracted to garbage scams, large commercial trash container, open dumps and unsanitary conditions and food processing sites. They feed on any manmade or naturally occurring moist household garbage. We are a highly acclaimed name in providing best in class Fly Control Services. We are leading service provider of Fly Control Services. We are engaged in Providing Flies Control Service.Our trained professionals interact with clients and understand their needs to provide this Flies Control Service. 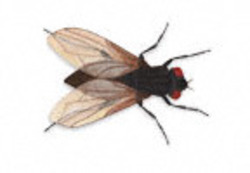 HOUSE FLIES : Flies breed in any decaying, rotting organic matter like garbage, filth, excreta, manure etc. Pecopp Pest Control Services Pvt. Ltd.
With huge clientele assistance and industrial understanding, we are engaged in offering Fly Control Service. Rendered beneath the supervision of highly able executives, these are largely commended all over the country. Moreover, our ability to alter them as per our patrons’ demands makes these highly well-liked. Flies are the pathogenic organisms of malaria, yellow fever, elephantiasis, fileria, dysentery & other diseases which are transmitted from animal to man & through various biting flies. Flies can be controlled by chemical spray and thermal fogging. They are also mechanically controlled by Electromagnetic & Ultrasound devices.